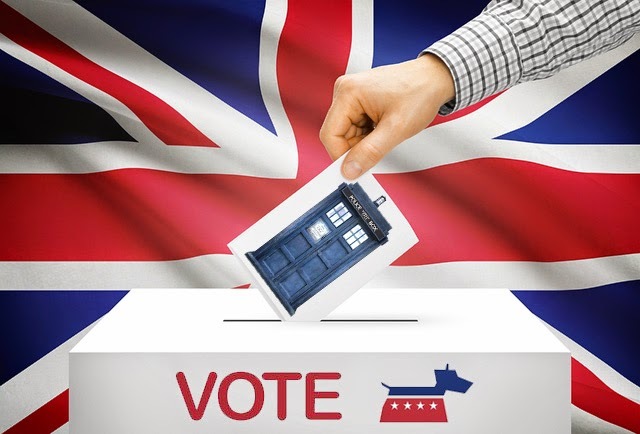 Doctor Who: Vote Time Lord! | Warped Factor - Words in the Key of Geek. 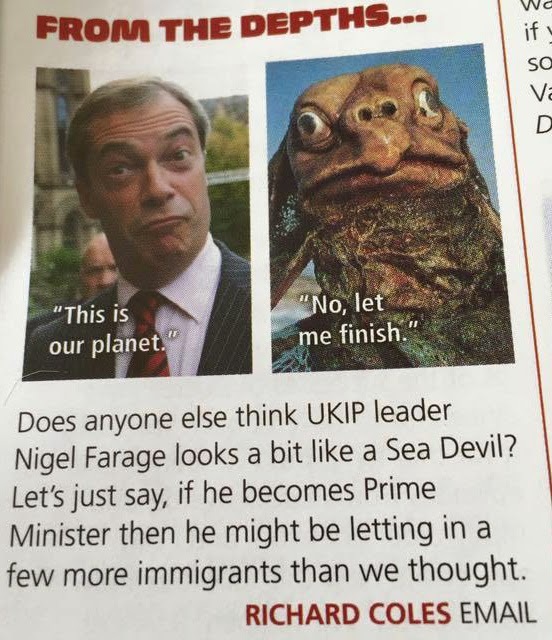 Doctor Who: Vote Time Lord! ...and Green Party leader Natalie Bennett, who may well agree with the aims of Operation Golden Age as seen in Invasion Of The Dinosaurs) is scrutinised to almost too fine a point. So what better time to park our political TARDIS firmly inside a voting booth and put a nice big X in the ballot box for The Happiness Patrol? Of course the late Margaret Thatcher held the Prime Ministerial reins of the country at the time- though her tenure in power would last only two more years following the November 1988 broadcast of the story which took many a swipe at her. Sheila Hancock's Helen A is perhaps the most thinly-veiled of its attacks on the Conservatives' Iron Lady. 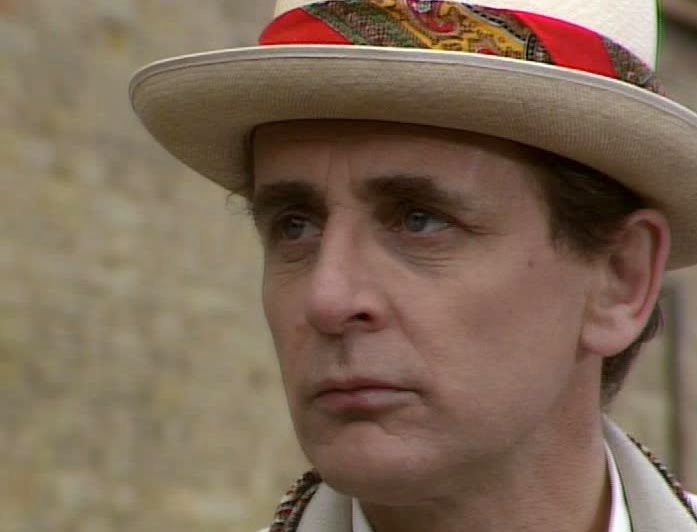 Speaking to the Sunday Times, Seventh Doctor Sylvester McCoy admitted that the move to bring politics into Doctor Who was made "very quietly" but nonetheless "deliberately". Script editor Andrew Cartmel was by his own admission the prime mover after getting the nod to work on the final three seasons of Classic Who. After getting his feet under the table he would set out his personal political beliefs in a chat with producer John Nathan-Turner. "I was very angry about the social injustice in Britain under Thatcher and I'm delighted that came into the show." Shared vision? Most definitely according to McCoy! "We were a group of politically motivated people and it seemed the right thing to do. Our feeling was that Margaret Thatcher was far more terrifying than any monster the Doctor had encountered." Interestingly, just two years earlier Lenny Henry had used a sketch on his self-titled programme to poke fun at both her and the technobabble of Doctor Who itself! "If we had generated controversy and become a cause célèbre we would have got a few more viewers but, sadly, nobody really noticed or cared." Though if he had turned over to Newsnight on February 15th, 2010, he might have been pleasantly surprised. ...just listen to Bonnie Greer getting it so wrong in her asssessment! ), but the very people Cartmel had been aiming his missives at were finally taking notice! The BBC's flagship current affairs programme went back and took a look at the political motivations of the man the Doctor had been before forced into off-screen limbo. The Seventh was quickly proven keen to get involved in the resistance against Helen A's dictatorship! "Now it’s certainly a good thing that people have publicly acknowledged that there is more to life than the level of our Gross National Product, that we’re just beginning to say out loud that corporate prosperity divorced from personal and communal fulfillment or stability is an empty thing. It’s when we try and put more flesh on this that it becomes more complicated – and, worse still, more self-conscious. 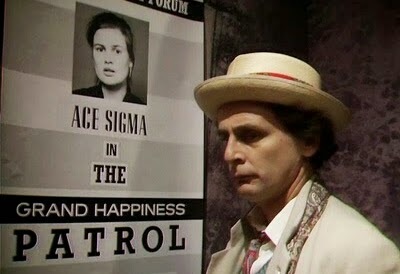 Some of you might just remember an episode of Doctor Who a couple of decades ago called ‘The Happiness Patrol’ where the Doctor arrives on a planet in which unhappiness is a capital crime, and blues musicians lead a dangerous underground existence. But less dramatically, most of us know the horrible experience of a family outing where things aren’t going too well and Mum or Dad keeps saying, through ever more tightly gritted teeth, ‘This is fun, isn’t it?’ There’s the catch: the deepest happiness is something that has crept up on us when we weren’t looking." 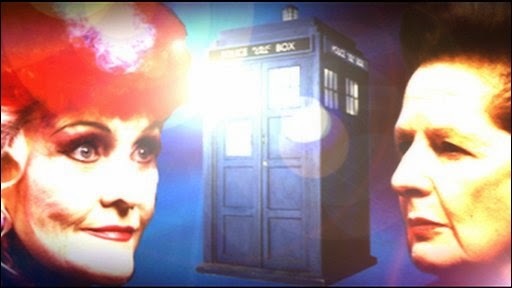 However you take the theologically-minded Doctor's interpretation, the one he recalled watching there wasn't too keen on where the TARDIS had deposited he & Ace. ACE: You're scared of them, aren't you? Up the killjoys! A Doctor with politics on his agenda and a feminist companion unafraid to speak her own mind- radical however you look at it, surely?